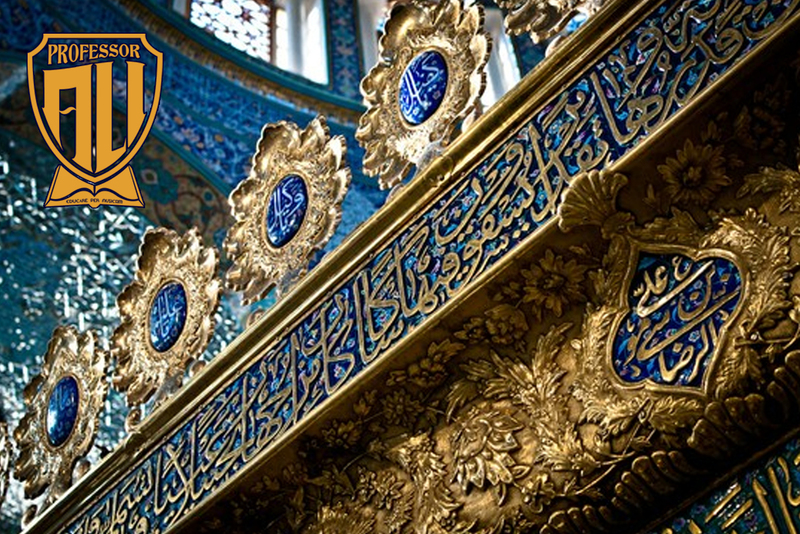 Zaynab Bint Ali – Professor A.L.I. When my high school history teacher Jeff Ustick first posed the question of what the purpose of history was, to me, I had little idea then that later in life I too would become a historian like him. At the time, there were several quotes he shared with us including the cliché, “those that do not study history are doomed to repeat it,” in an effort to spark a classroom discussion. I forget the ensuing conversation, but in the time since, in which I majored in history at U.C. Berkeley and went on to become a history teacher, I believe I found my own reason for why history should be studied and it is a nuanced perspective on the cliché I re-quoted above. I believe that history is filled with familiar patterns of human behavior. Once we recognize the catalysts to these behaviors we can begin to predict how humans might behave. This knowledge is therefore vital, if put to use to prevent wars and conflict—however and predictably so, human greed not knowledge tends to drive the actions of these political actors upon humanity’s drama. Take for example the role we, i.e. the West have played in the Middle East for the past one hundred years. Not unlike our ongoing relationship with the African continent, or throughout Asia, the Caribbean and also Latin America, we have engaged in the process of raw resource extraction for our profit, we have treated the Middle East as a place to deplete. The singular commodity interest that drives our involvement in this region from aid, to military support, to coups and wars has been oil. There are other resource interests in this region, but oil has been the dominant resource extracted and the need for it has consumed both politicians and robber baron alike. Unfortunately, based on how we’ve proceeded and whom we have backed in our thirst for oil, we’ve shown clearly that we haven’t understood the history of the region and have mucked it up as a result. Minimization is part of the problem. Our media minimizes whole regions to fit into a neat, homogenous, black and white worldview–simplified both for our consumption and support. We mindfully use language to effectuate this black/white fallacy to those who, in our political system vote, putting people in office. The latter group in concert with business interests, use nation-state action to drastically intervene and subvert the interests of people in the regions we desire resources from. We couch it in language of democracy but have actively worked against democratically elected leadership in these regions. When democratically elected Mohammad Mosaddegh in Iran jeopardized the Anglo-American Oil company (later known as British Petroleum or BP) interests in this region, they worked with our then president Dwight David Eisenhower to utilize the CIA to replace him with a dictatorial Shah, or king. Fancy that! Our nation, which was born in reaction to the policies of King George that had people taxed without representation and whose ideological framing was the antithesis of monarchy, was, two-hundred years later actively supporting/creating monarchy so that multi-national business interests could take advantage of people, effectively extracting their wealth, where they had no voice to stop it. The irony (pun intended) is almost unbelievable. This is where we are currently, operating in the same way throughout the world. We are not the only ones, the United Kingdom, France and Germany along with China, South Korea and Japan are all vying for the same resources and using similar means in order to wrest control. In the Middle East, we are all interested in oil. We are a fossil fuel driven world, and in this world oil is king. When the British and French became involved with the Ottoman Empire’s losing grip on the Middle East, they created nations, just as they had in Africa that never truly existed except on the resource maps of European dreams. Jordan, Kuwait, Saudi Arabia are all made up nations that never existed historically. They were created to help divvy up that region. Iraq and Syria had historically existed but their new borders were more arbitrary than based on the historic record. Palestine became its own issue, which continues to this day, but in the case of Saudi Arabia, you see the sinister machinations of the British Empire, creating the octopus, from whose outstretched tentacles refugees now flee. The house of Saud began as one of many tribes trying to control the Nejd and Hejaz regions of the Arabian Peninsula. The House of Saud needed ideological backing and they found it in Abd-Al-Wahhab, a pseudo-scholar who was cast out of his own village as a madman, who had re-discovered the works of Ibn Taymiyyah and continued to argue as he did that Islam needed to be purified and that innovation, or bidah, had overpowered its essence. This framing, later called Wahhabism or Wahhabi Islam gave the Saud the excuse it needed to unify the tribes under its banner and oppose the Ottomans. The British come in and support see Lawrence of Arabia for context and the nation of Saudi Arabia is born. There are arguments out there that the British had knowledge of oil in the Arabian Peninsula back in the 1870’s, when its value would have been more as a source of lubrication for machines than fuel, still, whether they did or not, they created the octopus and its tentacles grow forth from the Wahhabism that spreads, morphs into Salafism, an even more extreme, puritanical interpretation of Islam and creates arms for the kraken of terror named ISIS or DAESH, the Taliban, Al-Qaeda, and Sepa-E-Sahaba to name a few. These arms do not represent the majority of Muslims, however, the arms have spread due to the oil money that fuels its source. History has catalysts and human behavior is predictable. What the British did with Saudi Arabia we tried to do with Iran, and then we tried again with Al-Assad in Syria and Saddam in Iraq, after enabling the latter in the first place, and we’ve made a mess of that region, giving the Wahhabi/Salafi beast its building blocks in unemployment, instability, crusader-language that polarizes the them as much as it does the us, and war. We have sold them the weapons that they use against us. We have made our citizens targets, while we have actually targeted theirs with drone strikes and we now sit back and use rhetoric that further enables them, because this octopus needs to feed its tentacles with a combination of ignorance and fear and our media provides dosages of both so it actually is unsurprising to hear brainwashed Muslim teens trying to get to Syria to join DAESH/ISIS or to become brides for their soldiers. All the while, we engage in a steady stream or extraction. We denounced Al-Assad for his dictatorship, also with Saddam and Qaddafi, but oil stable Saudi Arabia is predictably our friend. We refuse to denounce their treatment of women and religious minorities, the countless abuses they engaged in, human rights violations too lengthy to even list here and a monarchy that gives little real voice to its citizens while exporting a brand of a puritanical and extremist brand of Islam that argues that innocent people can be killed (violating one of the most fundamental core Abrahamic principles of “Thou Shalt Not Kill”) and that Muslims should be in a perpetual state of war against non-Muslims. My students ask me, what they can do, while straddling the line between cynicism and hope? My human family, fellow Americans, people living in the west and Muslim brethren ask the same question. To all these groups I have the following answer. Recognize the pattern in human behavior and understand the history. Go deeper, even when the media or Hollywood advises you to remain on the surface. There is knowledge at the depth that I will share with you, but continue the research beyond. If you understand the truth I will share and help others to as well, then I am certain that we can combat the wave of ignorance that feeds the Wahhabi octopus. I also believe if our policy-makers were more informed, then we’d be able to create mutually beneficial partnerships for resources (while we also transition to a model that is not fueled by fossils) between nations instead of one that finds us in a manipulative relationship with regions. What the ISIS/Daeshes, Talibans and Al Qaedas of the world are doing is not new. You can find their model in early Islamic history. In the year 680, and event took place in which a woman from the bloodline of Abraham and Muhammad was brutalized and chained. She watched her brothers, her nephews, including infants, and her own sons murdered and their heads chopped off and placed on spears. 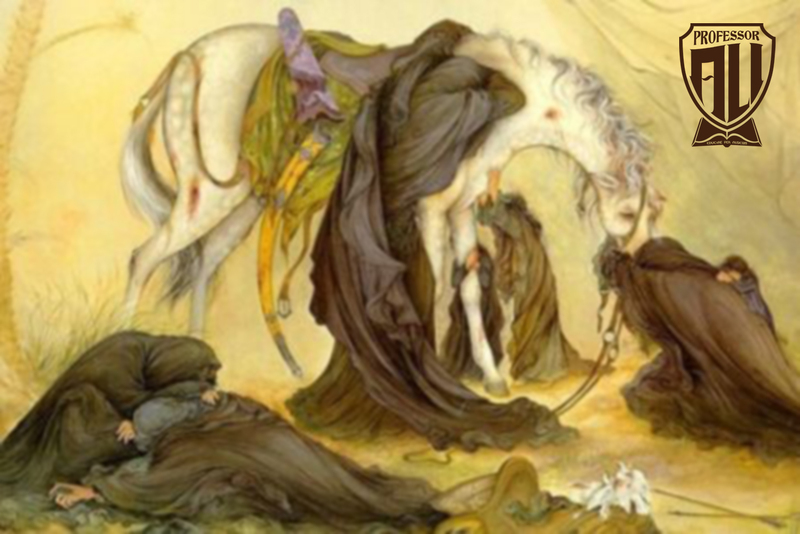 She was taken to Kufa and then marched through the desert with the survivors of this massacre, in which her niece and others would perish and placed in a dungeon in Damascus. In spite of this she spoke out, and when she found herself placed before the Caliph named Yazeed, she trounced him verbally with the eloquence of her mother and grandfather and the people took note of her narrative. Her words, which reminded the people in the court of what Islam was truly, a religion of equity and equality and of justice and peace, stirred hearts and the public pressure made Yazeed release her. She continued to proselytize and tell her story until she died. She represented feminism, legitimacy and truth. She is the reason why the largest pilgrimage in the world is to Karbala, where the initial massacre took place. She is the reason why the Taliban focused first on massacring the people of Mazar-E-Sharif (people who claim to be descendants of her bloodline through her lone surviving nephew, and ultimately that of her grandfather). And she is the reason why ISIS aka DAESH, in 2014 attacked her shrine in Damascus where many believe she is buried and is a popular place of pilgrimage. Her name is Zaynab and she represents us. Her story is so threatening to the octopus, that its tentacles attacked her shrine and her supposed descendants before it ever attacked us. Why is she such a catalyst? What would fear truth? Perhaps a lie? What would fear feminism? Perhaps patriarchy? What would fear legitimacy? The illegitimate? I am convinced that if my students, my fellow Americans, my human family and my sisters and brothers of the Muslim faith understood who Zaynab truly was they could use her as a catalyst to combat the ignorance that feeds the tentacles of terror as well as the kraken itself. I wrote the song “An Ode To Zaynab” in an effort to raise this awareness and I did so before ISIS ever attacked her shrine—but recent events compelled me to create the hashtag #IAmZaynab and the video that follows, which is an effort to capture this historical truth. This video was made with participation of people throughout the world, from the Middle East, through Europe, Canada and the United States. It is a video of people holding signs that say simply, “I Am Zaynab” along with her narrative captured in a verse that emulates the Masaib or Elegy traditionally given for her in Hip-Hop. It is my hope that through this piece of art, this article and others like it that we allow Zaynab to be a catalyst for us to help change the world with knowledge, born from a place of Authenticity, Love and Intellect. The song “An Ode To Zaynab” is available on Professor A.L.I.’s XFactor double-album on iTunes & free-streaming on Spotify. The life of Zaynab bint Ali remains a relevant narrative even today, and in places you’d probably least expect it, despite nearly 1300 years between the events of her life and our life today. Annual commemoration in the form of poetry of lamentation has become a part of the religious tradition of many Muslims, some Middle Eastern Christians and a small group of South Asian Hindus and continues to be a growing practice in many parts of the world through immigration and conversion to this religious practice. Zaynab’s story is clearly couched in a religious narrative, one of subjugation and martyrdom, where an oppressor strikes out against those cloaked in divine practice. However there is another thread of inspiration that connects back to Zaynab bint Ali that remains relevant today and that is her influence on oral histories and subsequent poetry in Northern Africa, to West Africa and through the Middle Passage onto the West in the form of poetry and musical traditions. This is the story that Professor A.L.I. begins the journey with, in the “XFactor” a curricular album, which explores the connection of Makkah to Mecca (aka New York), in the development of narrative traditions and the emergence of Hip-Hop as a form of cultural expression in the inner city. In an “Ode to Zaynab” he states “The daughter of a martyr, the mother of slaughter, the daughter of a Prophet, a leader of hardship and inspiration for artists…” a reference to Zaynab’s robust impact, a thread stretching all the way to the modern day helping to weave into the culture known as Hip-Hop. Hip-Hop, though lyrical is often a controversial subject matter and Professor A.L.I. does not pull any punches and instead digs into themes of misogyny and racism, while elucidating the difference between real “Hip-Hop”, i.e. intelligent movement, from the popular construction of a musical genre, which objectifies women and engages in coarse language. It is the former that falls in line with the lyrical narrative and the traditions influenced by Zaynab bint Ali. The album is intertwined with a robust curriculum that starts with the story of Zaynab and continues forward through time, ending with the narrative of the late Malcolm Shabazz, the grandson of Malcolm X, who for a brief time studied at a howza near the shrine of Zaynab in Damascus. Finally the robust historical curriculum woven into this album did not go unnoticed by the University of California Regents, which rewarded the course being taught by Professor A.L.I., in which his album is an integral component A-G History credit. In addition, the course has become so popular it will be taught at five elite Bay Area college prep schools. The course, as with the album, begins with the story of Zaynab.